Hyperspectral camera operating in the VIS and VNIR ranges of 380-800 nm and 400-1000 nm. With its high resolution, high image rate, flexible wavelength selection, and rugged structure, Spectral Camera PFD is an excellent tool for industrial measurements. S pectral Camera is an imaging spectrometer, an integrated combination of our ImSpector imaging spectrograph and an area monochrome camera. It works as a pushbroom type line scan camera and provides full, contiguous spectral information for each pixel. 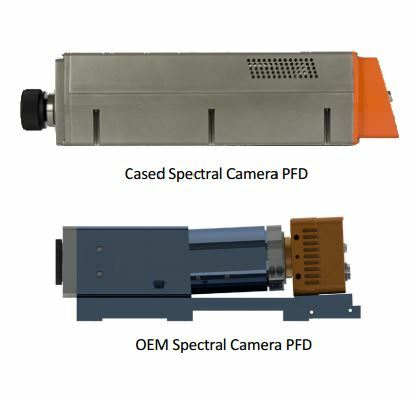 The Spectral Camera PFD consists of an ImSpector V8E or V10E for the wavelength range 380-800 nm or 400-1000 nm, respectively, and a high speed CMOS detector. The transmission diffraction grating and lens optics used in the spectrograph provide a high quality, low distortion image that is designed to fulfill the most demanding specifications. This Spectral Camera provides the flexibility and high speed acquisition required in the industrial QC applications. Combination of multiple Region-Of-Interests and binning gives a possibility for the optimal system setup and control for the user. Full spectral range can be acquired with 150 fps at 1 312 spatial locationsand up to 100 Hz with higher spatial resolution of 1 775 pixels. By selecting partial spectral ranges, speed up to 1 000 fps can be achieved.